All managers have a responsibility for the successful operation of their business. 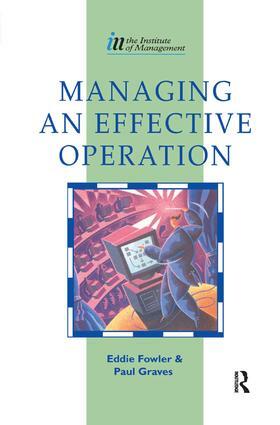 Managing an Effective Operation shows how you can effectively: set departmental objectives within the context of an organisation measure the competitive advantage of your business manage the operational task balance resources and demand develop facilities and systems to ensure quality achieve continual improvement accomplish change management manage your time Throughout Managing an Effective Operation, practical illustrations and examples are used to show you how to achieve high operational standards, quality performance and maximum profit. Managing an Effective Operation is designed to provide underpinning knowledge and understanding required for any competency based management course. It is based upon the Management Charter Initiative's Occupational Standards for Management NVQs and SVQs at Levels 4 & 5 and is also particularly suitable for managers on Certificate and Diploma in Management programmes, including those accredited by BTEC. Paul Graves is a Managing Consultant at Sundridge Park Management Centre. Eddie Fowler is an independent consultant and an Associate of Sundridge Park.